The damper, like the stabilizer, breaks sometimes and requires maintenance. This is because of the air getting into the system (due to which dips appear during the rod movement) and the oil production, which decreases the resistance, making the latter not being enough even in the maximum adjustment position. The filler block can also be damaged and leak. If the filler blocks do not leak, then going through the damper and changing the oil is possible without a repair kit. With proper disassembly-assembly, you can keep all items in working condition. If the filler blocks leak, you definitely need a repair kit. In the repair kit except for filler blocks and circlips there is the entire adjustment mechanism. Fork oil is poured into the damper. Viscosity is selected individually. If the motorcycle is operated on hard settings, then it makes sense to pour in a more viscous oil. We poured in 15W medium viscosity oil. 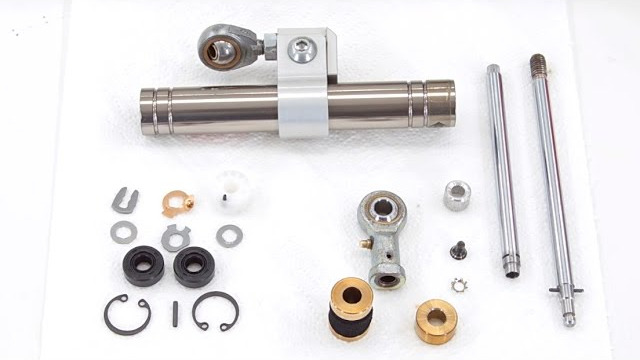 Below you can find a detailed video about how to rebuild a LSL titan stabilizer. Don't forget to turn on English subtitles!